DK-LOK® Two Ferrule Fittings are designed using industrial codes producing maximum leak free swaging action and sealing integrity. 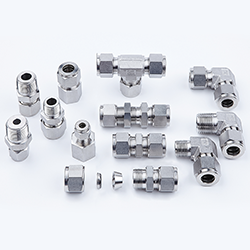 DK-LOK® Two Ferrule Fittings provide excellent leak-free sealing on high pressure gas, vacuum, impulse, thermal shock, heavy vibration, and many other stringent applications. DK-LOK® Two Ferrule Fittings take advantage of a FULL MASS back ferrule using a patented selective leading edge heat treatment that maintains and preserves the natural corrosion characteristics of the 316 stainless steel base metal. This patented technology keeps the hinge point of the ferrule shaft near the leading edge. The remainder of the back ferrule remains in a ductile condition that properly reacts to the forces at work during installation producing a smooth, low-torque, pull-up with maximum bite depth and grip for a leak-free seal. DK-LOK® brings you truly excellent quality, outstanding customer service, and availability at a low total cost of ownership. Our goal is to exceed customer expectations!